This event will be streamed live starting at 7 p.m. EST. Participants with caps and gowns are asked to assemble at the Coliseum at 5:45 p.m. on Thursday, May 9 and proceed directly to the name card table in the lobby to receive a name card. After receiving a name card, participants should proceed inside the Coliseum and locate their curriculum line. Signs will be posted designating specific locations for each curriculum. Once in the curriculum line, college staff will assist with the organization of participants in alphabetical order. During the ceremony, participants should leave purses, cell phones, keys and any other valuables with family or friends; such articles will not be allowed on stage and may not be safe if left unattended. Participants should remain in their seats. Balloons are not allowed inside the Coliseum. Participants with a condition requiring special attention or assistance are requested to contact Carmen Charland at (757) 825-2846 or (757) 825-2853 (TDD) by Monday, April 23.
Business attire. We suggest participants wear black shoes. No jeans. No flip flops. The Coliseum’s seating capacity allows an unlimited number of guests. Packages of 10 non-personalized commencement invitations are available for purchase from the College Bookstore. Guests will not be allowed to enter the ceremony during the graduates’ processional. The ceremony will start promptly at 7 p.m. Guests are to remain seated during the entire ceremony. Guests with a disability should make special needs known to an usher upon arrival at the Coliseum. Due to limited seating, guests with disabilities may have one person accompany them in the handicapped seating area. A professional photographer will be present during the commencement ceremony to take color pictures of participants as they receive their diploma covers. The full-color proofs of these photos will be mailed free of charge approximately one week after the ceremony. Enlargements will be available, directly from the photographer, for a reasonable price. Since photography services will be available, no family members or friends will be allowed on the floor to take pictures. For information regarding caps & gowns, class rings, and non-personalized invitations, contact the College Bookstore. 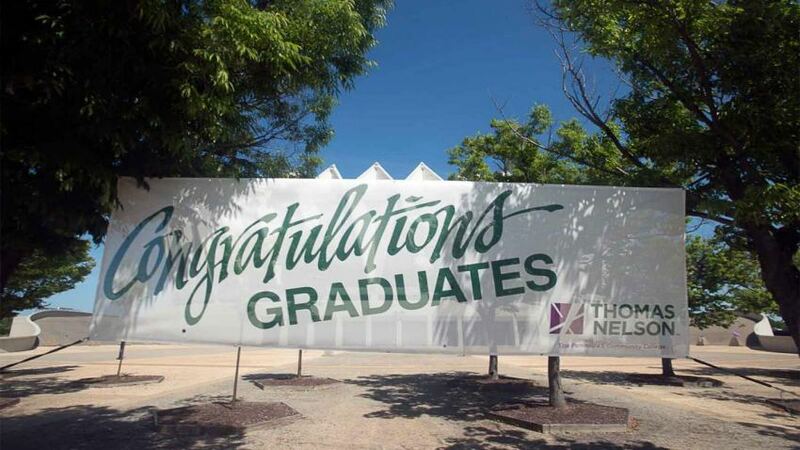 For information regarding the ceremony or a participant's graduation status, call (757) 825-2846.